Extensive rehabilitation of an aesthetically challenging case with advanced periodontal disease, failing teeth and bone loss. A 40 year female presented with advanced periodontal disease and requested an aesthetic restoration of her mouth. She had already suffered some tooth loss and all of the remaining maxillary teeth were very mobile with advanced bone loss around most of the teeth in the upper jaw and lower right posterior teeth. These teeth, with the exception of the upper canines, were hopeless. The real challenge was to achieve a result where good soft tissue aesthetics and a scalloped gingival architecture were maintained in this patient with high aesthetic demands and a high lip line. Immediate implants, bilateral sinus lifts and bone grafts and a full upper and partial lower restoration was carried out along with thorough periodontal therapy. The ‘after’ slides taken 3 years after case completion demonstrate excellent maintenance of a superb result with a fabulous smile and excellent soft tissue aesthetics. 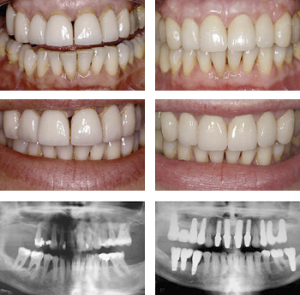 The comparison of the preoperative smile and the smile at 3 year follow up highlights the aesthetic improvements with excellent soft tissue form. Not only is the gingival architecture maintained but the improved tooth form also allows for enhancement of the aesthetics of both the teeth and gingivae. Note the maintenance of the interdental papillae and gingival architecture in this extremely difficult case.